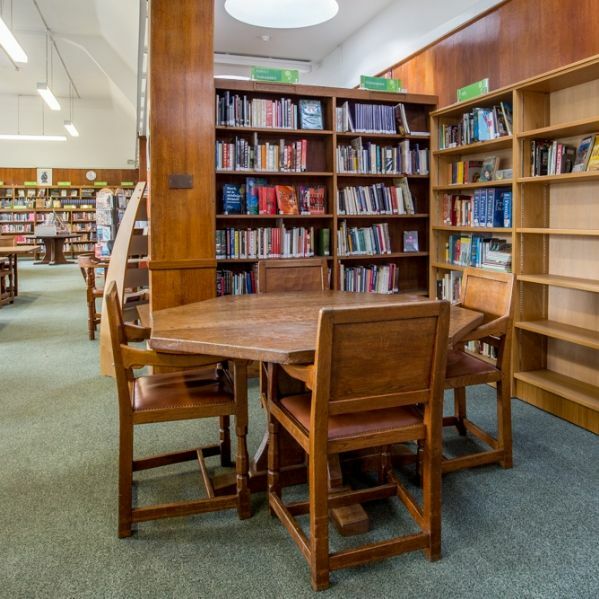 Miss Emma Wallace, Senior Librarian at St Benedict's, looks back over a century at the history of St Benedict's libraries. 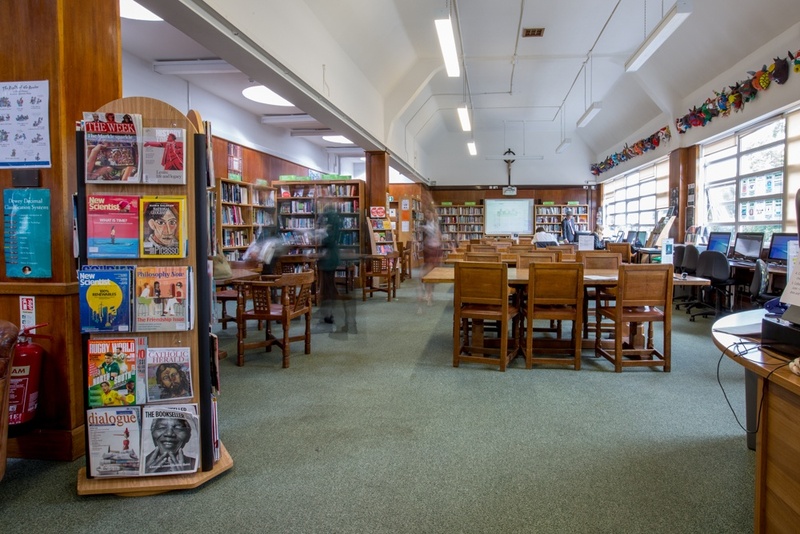 St Benedict’s Senior School Library is located in one of the school’s most impressive rooms, found on the third floor of the classroom block running along Eaton Rise. 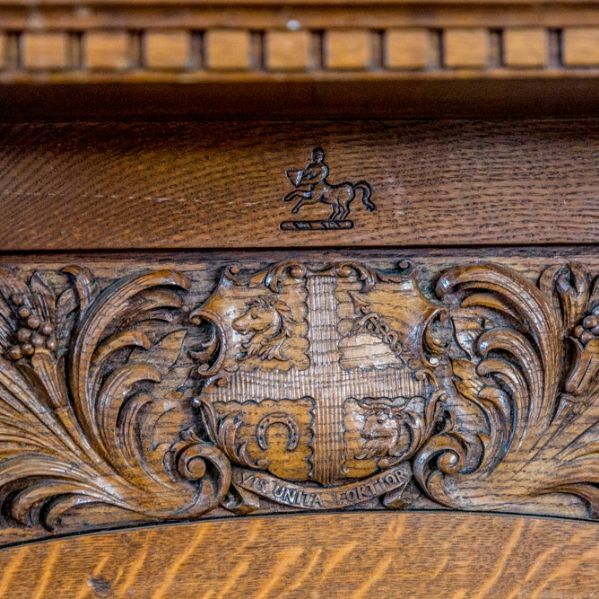 It has been in this room since 1957, displaying high ceilings, oak panelled walls and handcrafted English oak furniture, made by the famous Robert Thompson Craftsmen. In this elevated position, the main library boasts a bank of east facing windows that ensures the room is bathed in early morning sunlight and is bright and airy throughout the day. 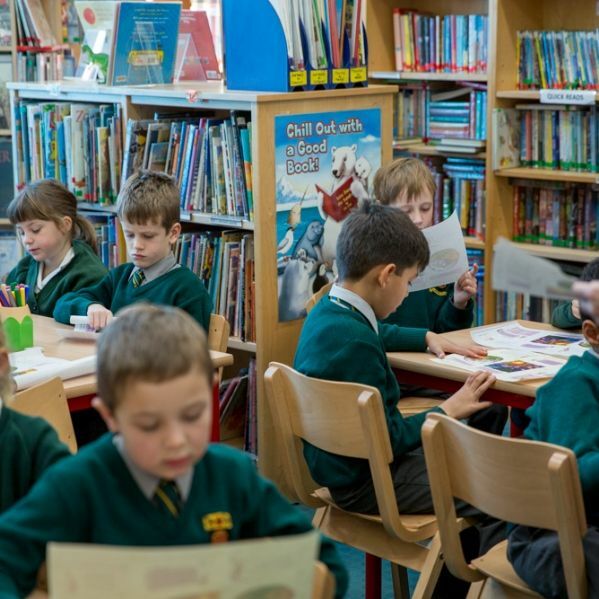 The history of the library and how it came to be here provides a fascinating insight into the development and growth of St Benedict’s School over its more than hundred-year history. 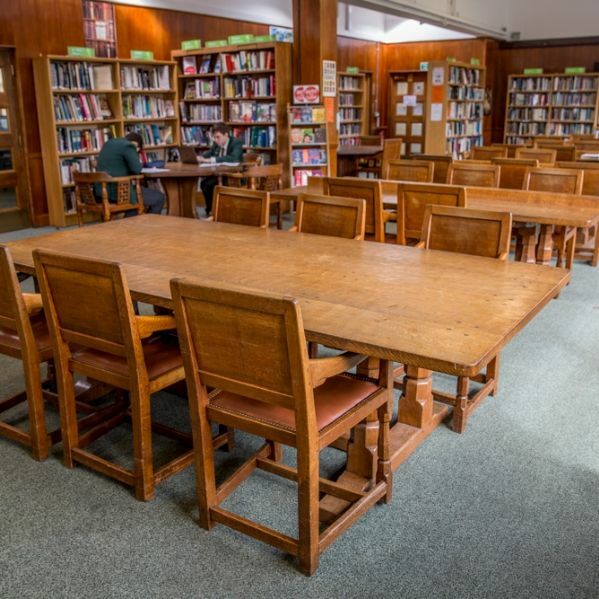 The library has been in this room since 1957, displaying high ceilings, oak panelled walls and handcrafted English oak furniture, made by the famous Robert Thompson Craftsmen. 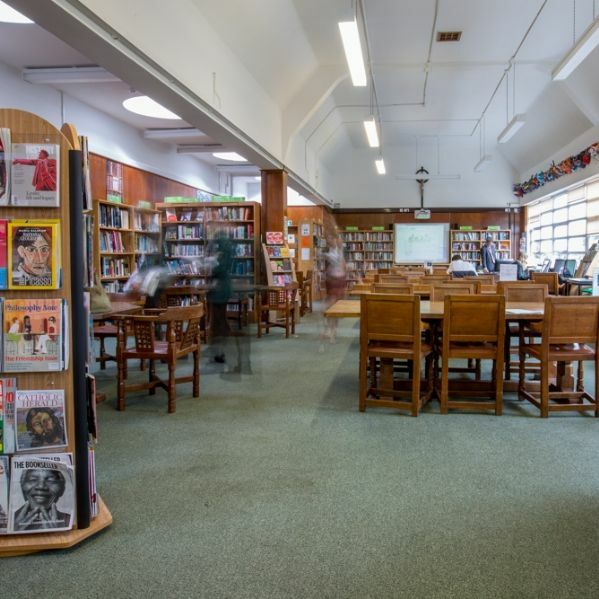 There have been various incarnations of the Junior, Senior, and Middle School Libraries at St Benedict’s, with the first librarian being listed as J. O’Connor in the very first edition of The Priorian magazine in 1927. 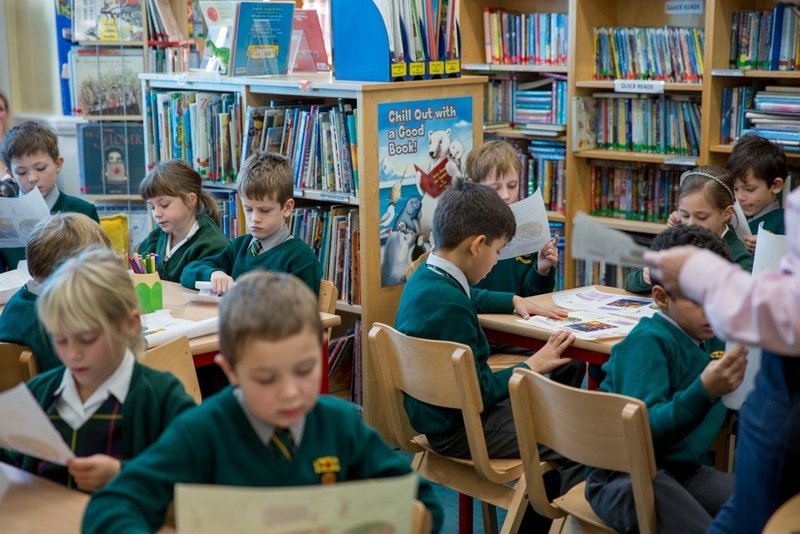 The Junior School appears in The Priorian at various times over the years, with one of the first library reports from the summer of 1954: “During this term a telephone has been installed in the library by the Signals’ Section and has proved to be a great asset.” (The Priorian (56), p.374). In 1955 the Junior Librarian M.C.B. Andrews wrote that “as white or cream had been seen on the wall for so long, it was thought that a change of colour was needed and lime-green was decided upon. 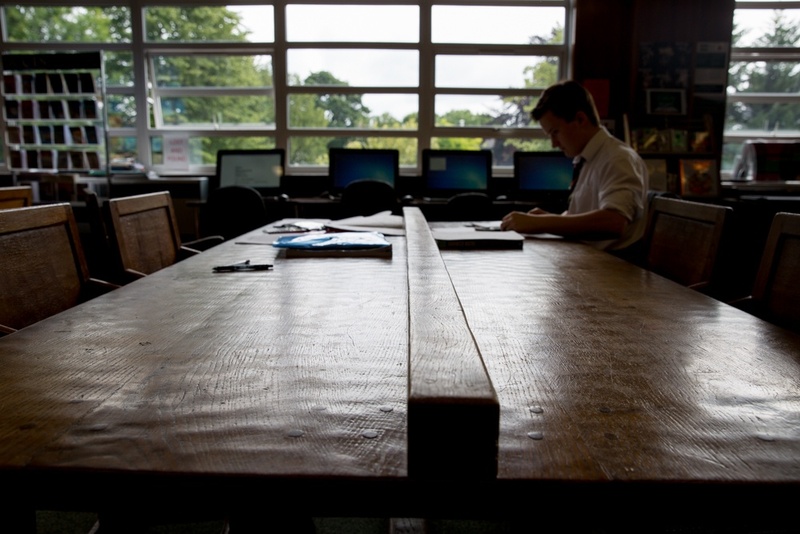 At the same time, an additional light was fixed up over the librarian’s desk…. As an additional comfort, G.W. Taylor has kindly given some red velvet curtains.” (The Priorian (58), p.77). 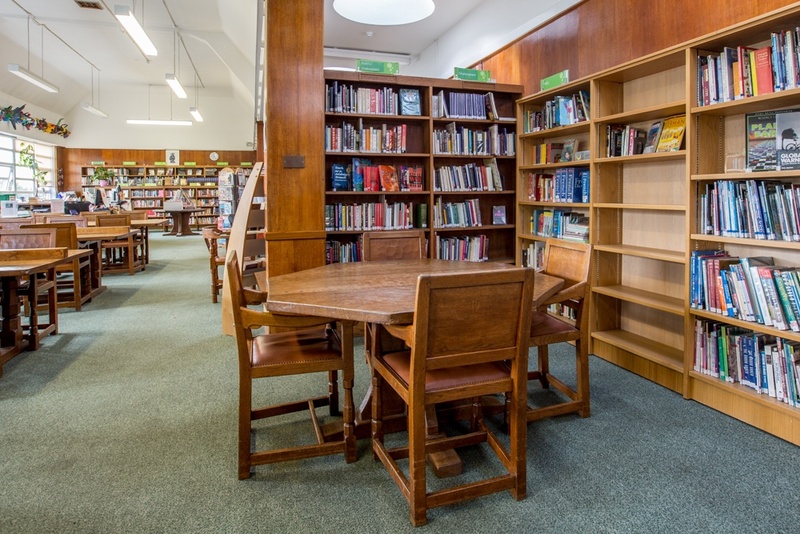 In the 1980s and 1990s the Junior School Library was located in the corridor on the first floor of the Orchard Dene building. Mr Abbot, already a form teacher, set about building stock, cataloguing it and organising fiction books into ten genres and information books according to Dewey. Later, he initiated the move to a computerised catalogue, today embodied in Eclipse. The running and decoration of the library was left to a group of cheery volunteer mums. 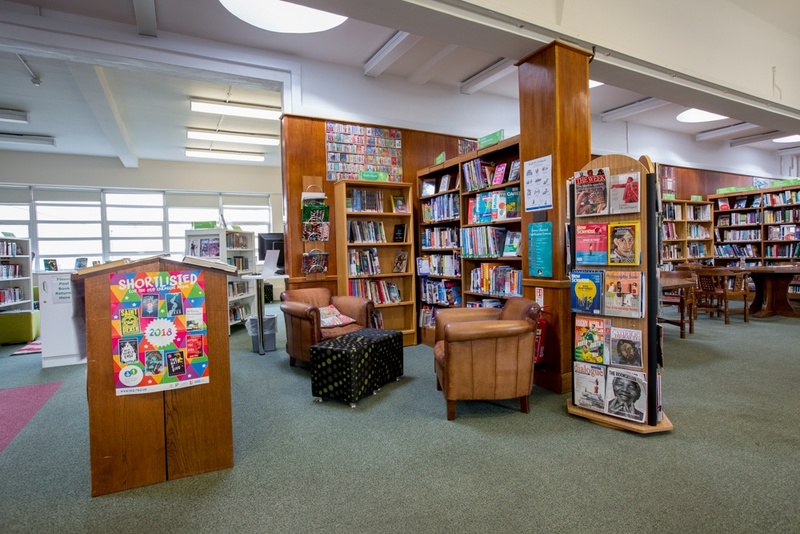 In 2001 a librarian, Mrs Celia Sweetman, was appointed to implement change The library moved in to a refurbished classroom on the ground floor of Orchard Dene, the Society of Parents and Friends financing the bookshelves which line the room. Mrs Sweetman, who is still in post today, reported in the 2009 Priorian “The library itself, a light and airy room overlooking the Abbey, is conducive not only to intellectual learning but also the learning of social skills.” (The Priorian (137), p. 64) Breaking new ground, Mrs Sweetman undertook to run weekly library lessons for pupils in addition to organising a well-stocked and vibrant library and form libraries The Junior Library continues to be very well used today, with all pupils able to use the space at both lunch time and after school, attending a weekly library lesson with Mrs Sweetman. 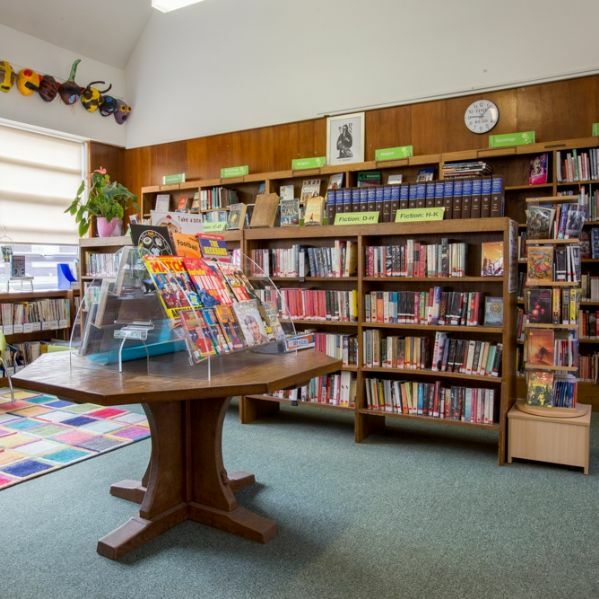 For a number of years there was also a Middle School Library, which was located in the attic of the Middle School building on 1 Montpelier Avenue. The first Middle School Librarians listed in The Priorian were J.N. McGrath and P.F. Tobin from 1954. 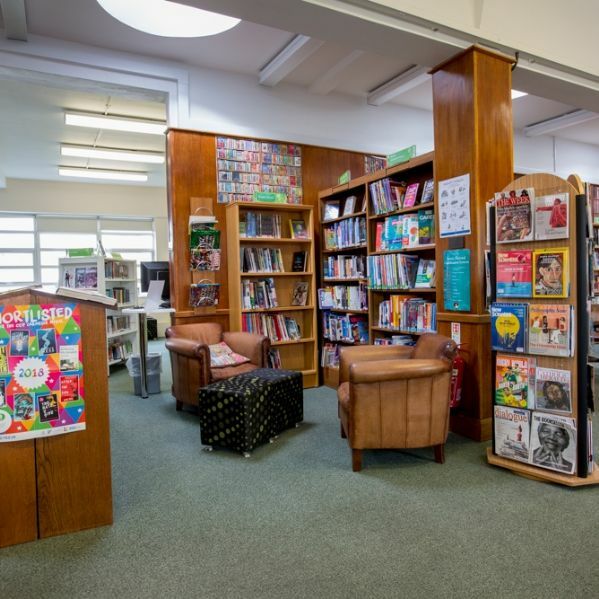 In 1958, it was noted that there were only about 150 books on the library shelves: “There are pre- and immediately post-war ‘Annuals’, outdated reference books on ships and aircraft, and some turgid nineteenth century school stories. Although the Encyclopaedia Britannica is on the shelves, there are no other reference books… There are three or four William books, and two or three Biggles books. The plays of Shakespeare are absent, as is any other semblance of literature, poetry or prose, which should be available at least for curiosity value. The Library cannot even boast a good dictionary.” (The Priorian (67) p.260) The librarian K.B. goes on to appeal for book donations to fill the newly acquired bookshelves and to rectify this situation. 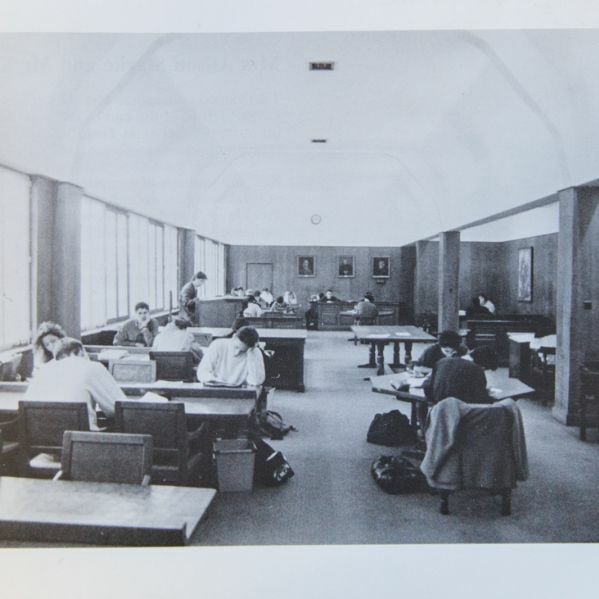 In the 1940s, the Senior Library was initially located on the first floor of the Eastdown building, where there were various faculty book rooms to support the different subjects studied by the boys at St Benedict’s (The Priorian (44), p.141). 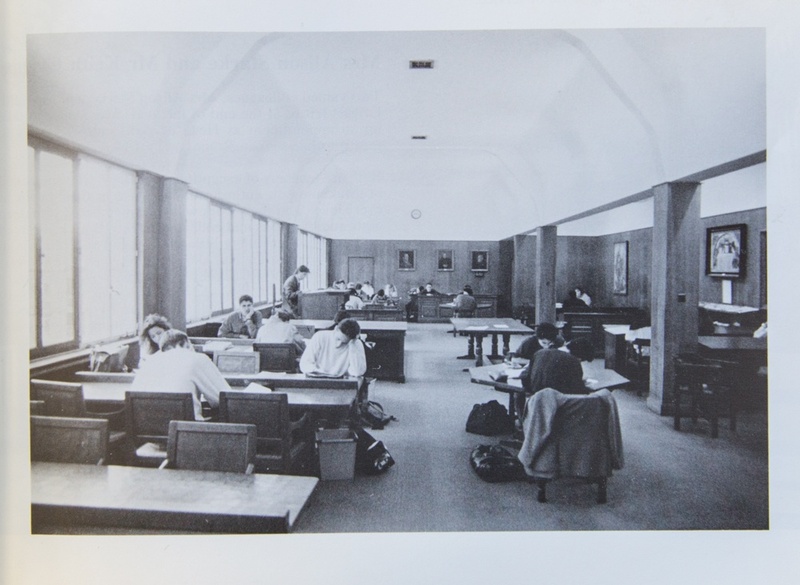 In the Lent term of 1950, the room was redecorated and “a fairly liberal supply of magazines and journals…provided to encourage interest in current affairs. After the bookcases were installed the library was set on foot by a fairly extensive collection of some 200 books on loan.” (The Priorian (43), p. 87). 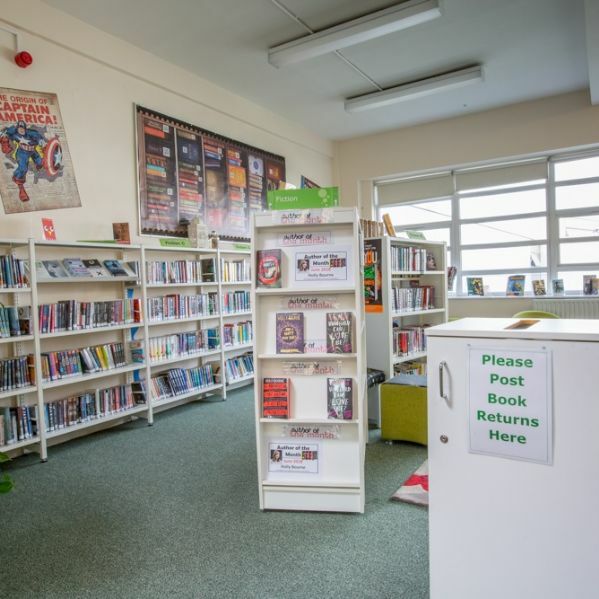 There are reports in 1952 that “Although the Recreational Library has been obliged to continue as best it can in its present cramped quarters, further improvements have been made to the various faculty libraries which now occupy the upper reaches of Eastdown, notably the relaying of the floor in the History Library” (The Priorian (48), p.434). 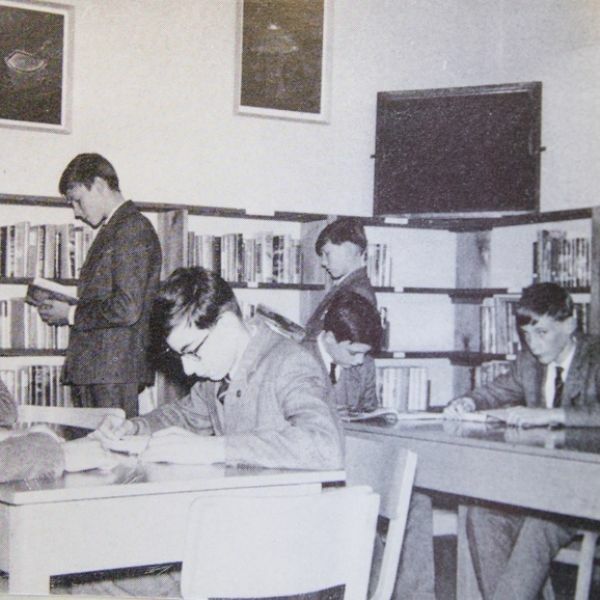 It was under the Headship of Dom Bernard Orchard (1945-1960) that the Senior Library was given real focus and investment, using the War Memorial Fund raised in the late 1940s after the Second World War, for “the provision of a proper and permanent library for the use of the Senior boys”. (The Priorian (64), p.54). Work began in 1954 on building the third floor on top of the main classroom block running along Eaton Rise to house the new Senior School Library. The same architect who erected the first two stories of the block in 1936, Mr John E. Sterrett, FRIBA, was employed to design the rest of the building. 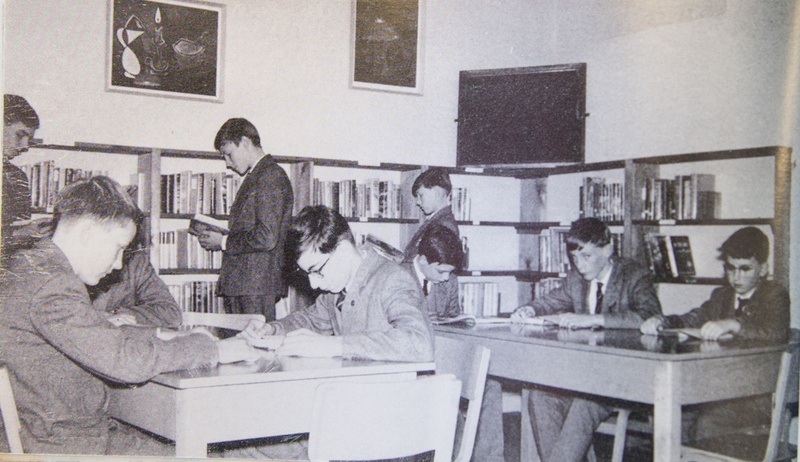 There are various reports of the library building project developing, with a description appearing in the Lent Term Priorian of 1956: “At the beginning of this term the upper school classroom block was encased in steel scaffolding and work began in earnest on the top storey that is to give us the School Library and four classrooms. In spite of a good deal of noise and rumbling overhead (not to mention the occasional window broken by falling bricks), classes continued as usual while the walls above began to rise steadily” (The Priorian (61), p.224). 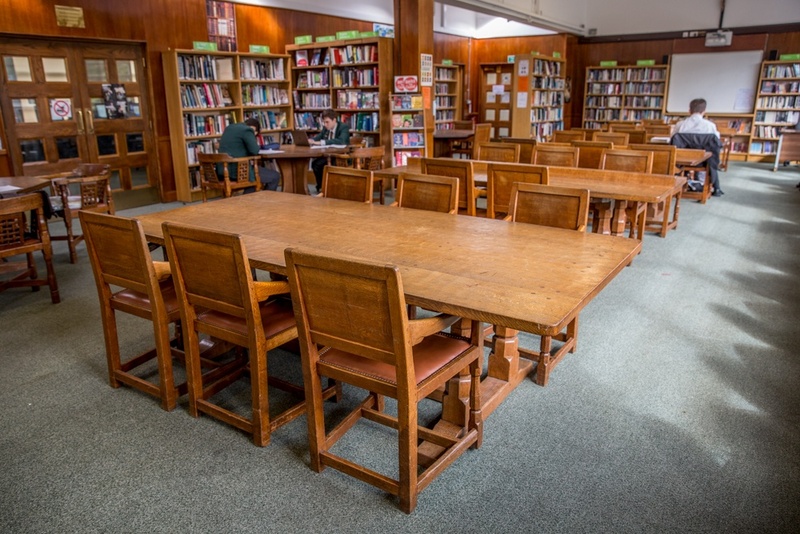 In March 1957 the Senior School Library finally opened for use, boasting a “splendid room, seventy feet by thirty, and is furnished with chairs and tables, handmade by the Robert Thompson Craftsmen Ltd, of Kilburn” (The Priorian (64), p.46). To formally open the Senior Library, named the Memorial Library, the Abbot of Downside (Right Rev. B.C. Butler OSB) was invited as guest speaker on Saturday 4th May 1957. 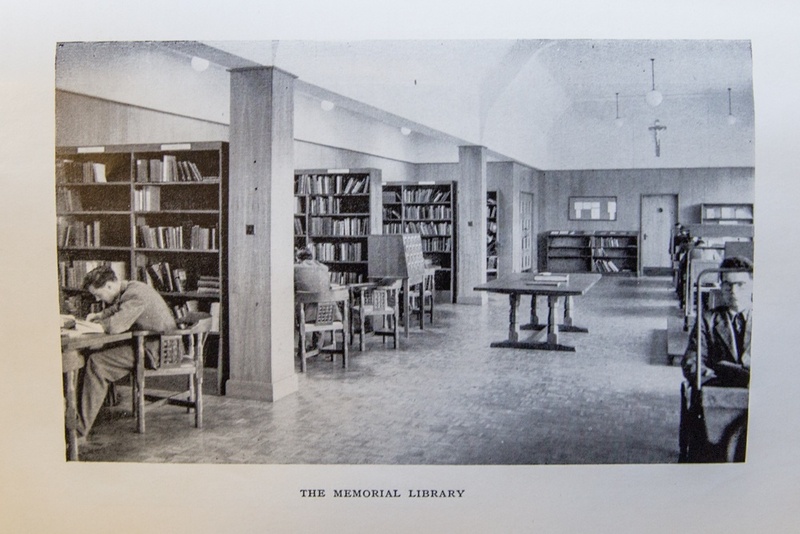 Announcing to a large audience of parents and friends of the School: “I declare open this Memorial Library, dedicated to the memory of those Old Boys of the School who gave their lives for their Country in the First and Second World Wars.” (The Priorian (64), p.54). 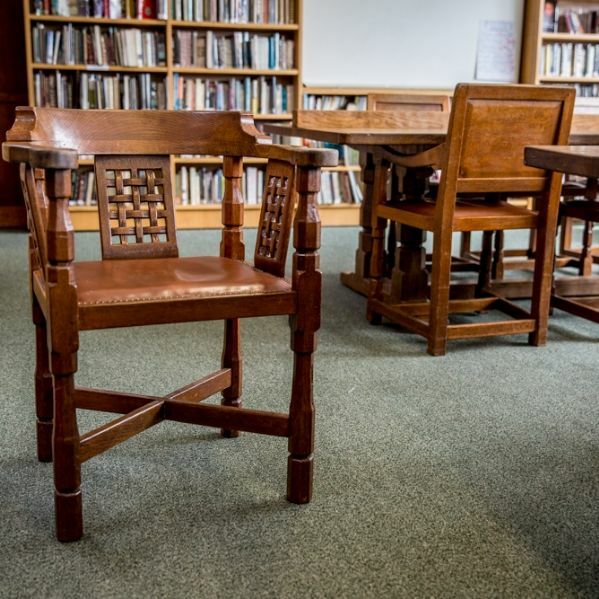 One of the most impressive features of the new Senior School Memorial Library was the beautiful Robert Thompson furniture positioned throughout the library. 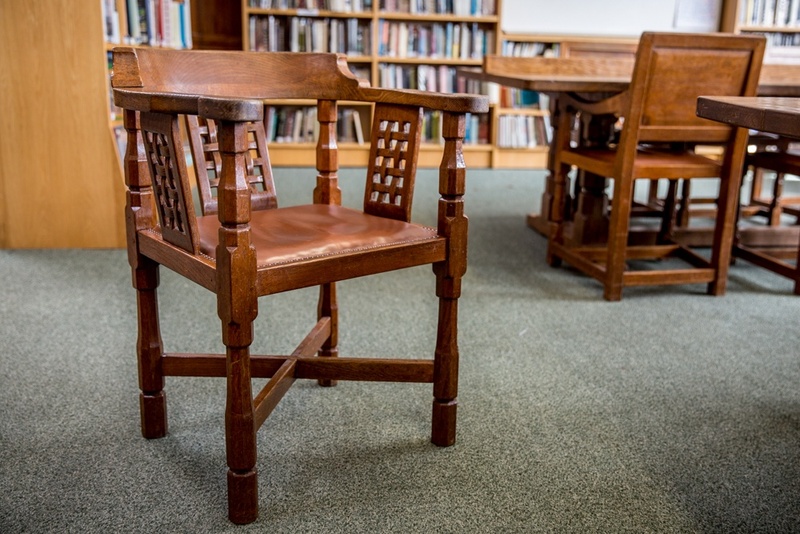 Headmaster Dom Bernard had taken inspiration from the furniture and interior found in the Senior School Library at Ampleforth College, Yorkshire. 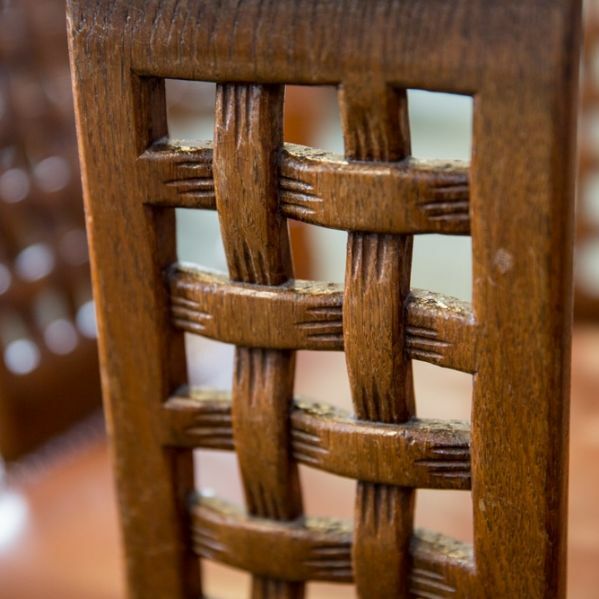 Robert Thompson (1885-1955), a then unknown craftsman from the small village of Kilburn Yorkshire, had been commissioned by Ampleforth’s headmaster Father Paul Nevill in 1920 to redesign the library. Ampleforth is still one of Thompson’s most important surviving interiors, displaying his unique craftwork. 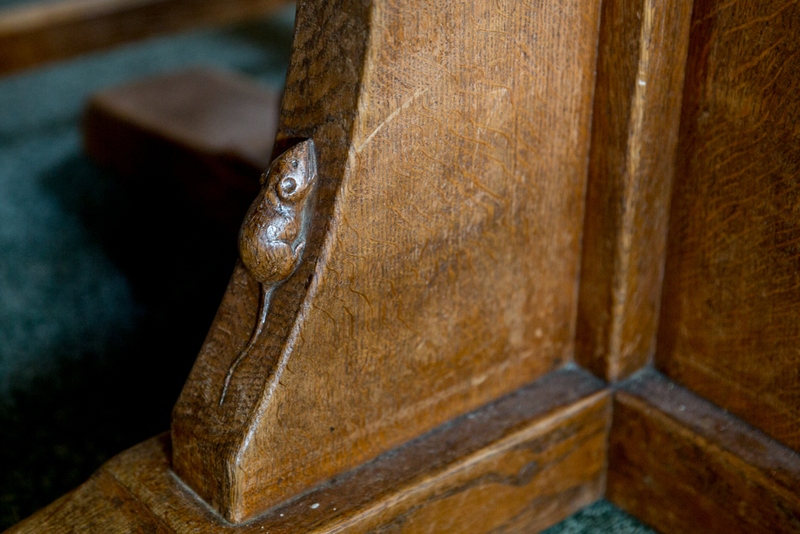 Each piece of furniture is entirely hand made from natural seasoned English oak, created using various hand held tools that give the furniture its distinctive look. 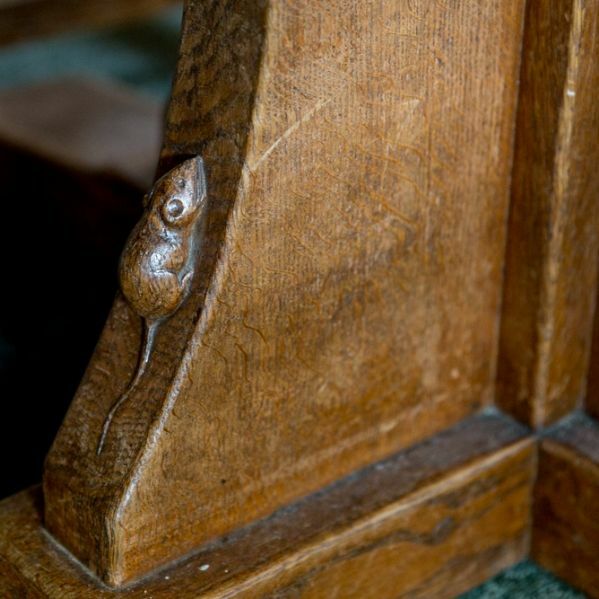 It was around 1920 that Thompson developed his unique signature and trademark, a mouse carved on each chair and table leg. This led to Thompson gaining his nickname Robert ‘Mousey’ Thompson, also known as the ‘Mouseman of Kilburn’ (Say Cheese, it’s the Mouseman - The Herald, 3rd June 1995). 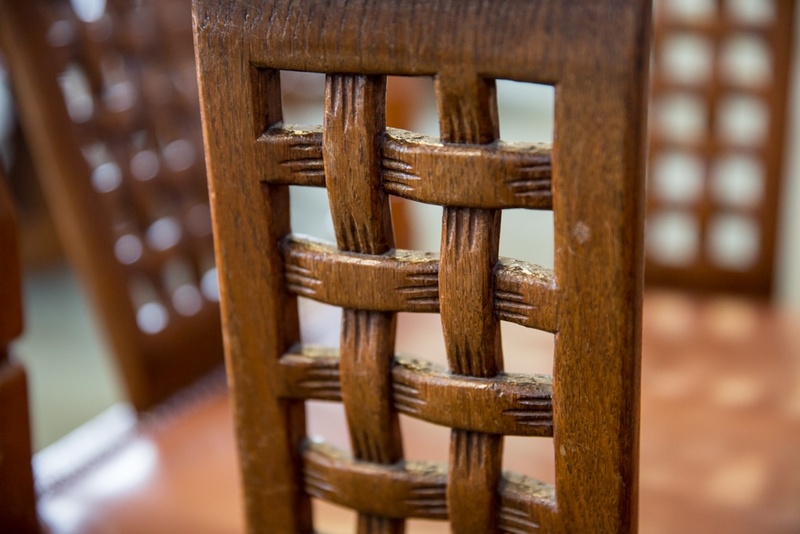 Thompson’s work is now highly collectable, with Robert Thompson’s great-grandsons still working at the same workshop in Yorkshire over 80 years later. A recent example of their work is the commission to create a new bespoke library and archive for Rothschild’s new headquarters in the square mile of London, which opened in 2012 (Broad). 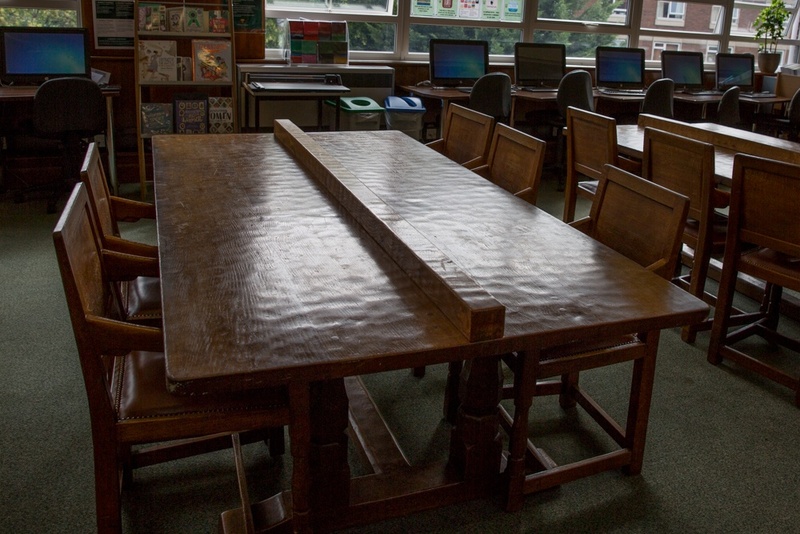 At St Benedict’s School the Headmaster Dom Orchard commissioned Thompson’s craftsmen to create six large oak reading tables and four octagonal tables, including a larger table (8ft by 4ft) for the new Senior Library in 1957. 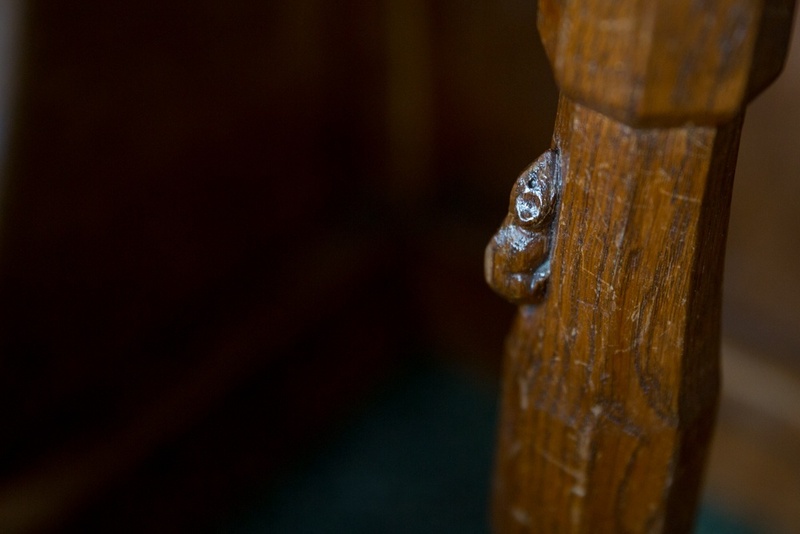 The table tops have the distinctive mottled effect, having been finished with the adze tool (Craftsman of Kilburn, Yorkshire Film Archive). The reading tables had three chairs positioned on each side, the chairs having a cowhide leather seat. 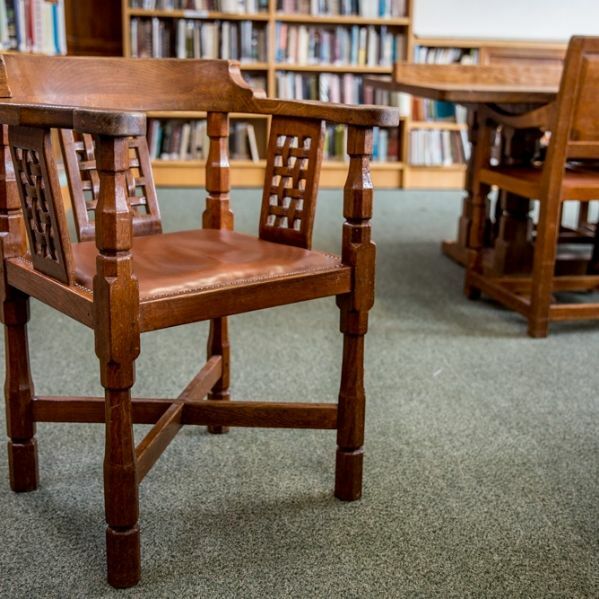 A set of ‘Monks’ chairs, originally created for the Ampleforth Senior School Library, was also commissioned. 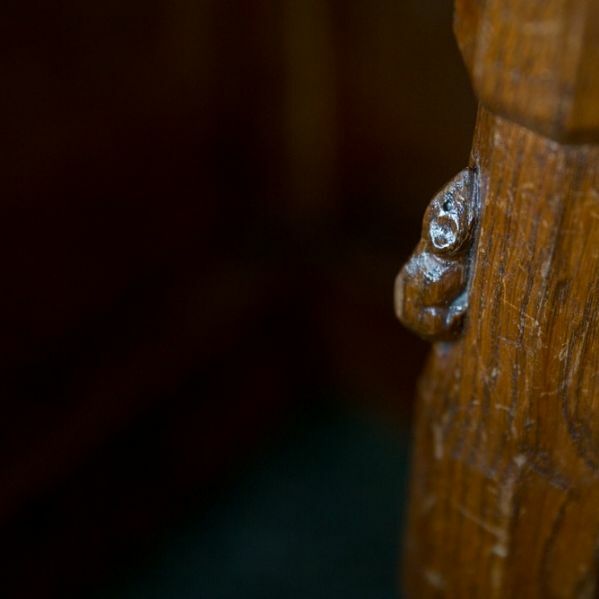 These were positioned around the four octagonal tables, located in the four alcoves on the west side of the library, and which “The Upper Sixth alone have the privilege of using” (The Priorian (64), p.54). This rule no longer stands! 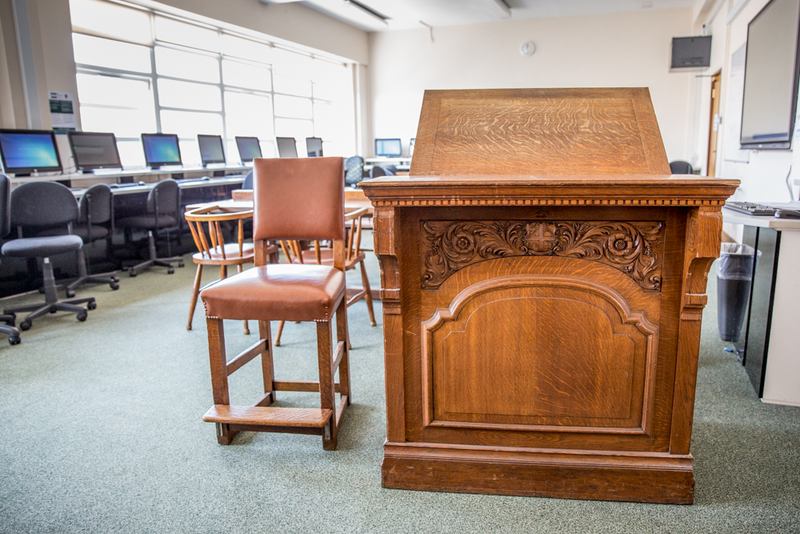 The Memorial Library was designated a Sixth Form study room, with a member of staff sitting on a raised plinth at the ‘Royal Veterinary College’ lectern (now found in the eLearning room) to keep the silence (photo, The Priorian (120) 1990-91, p.5) / (photo, The Priorian, (64) p.67). 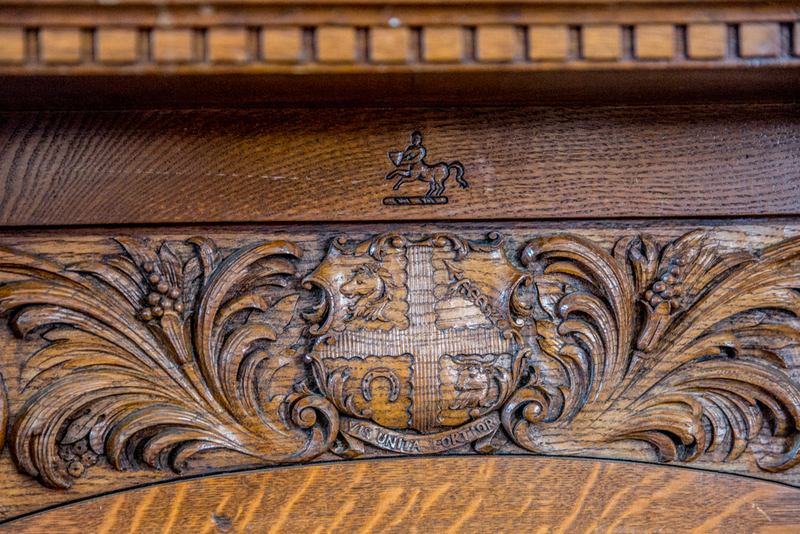 This lectern, gifted from the Royal College of Veterinary Surgeons along with some fine oak desks in 1962 (The Priorian (79), p.330), is an astonishingly fine piece of carving, displaying the RCVS’s Royal Coat of Arms and motto, Vis Unita Fortior - ‘In Unity Lies Strength’ (Flying the Flag for RCVS Day). 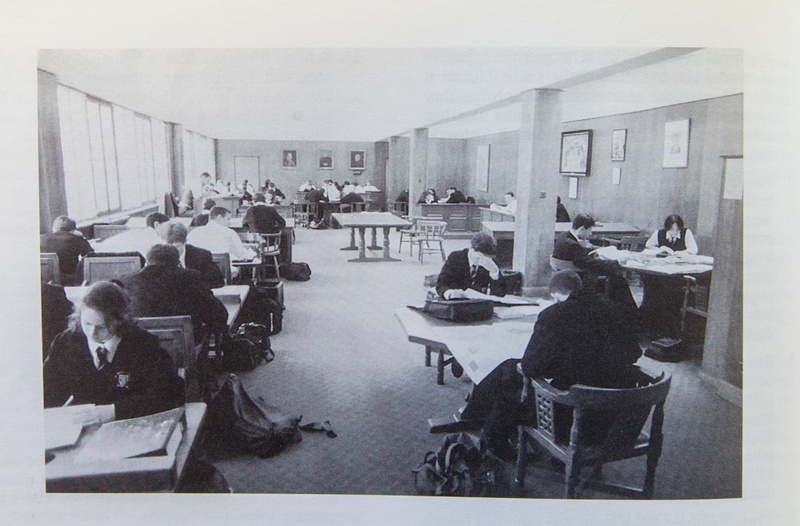 In the 1960s the Senior School added an additional library on the floor below the Memorial Library to accommodate the lower year groups - Lower Fourth, Lower Fifth and Upper Fifth - run by Lower Fifth pupils (photo plaque, The Priorian, (84), p.53). 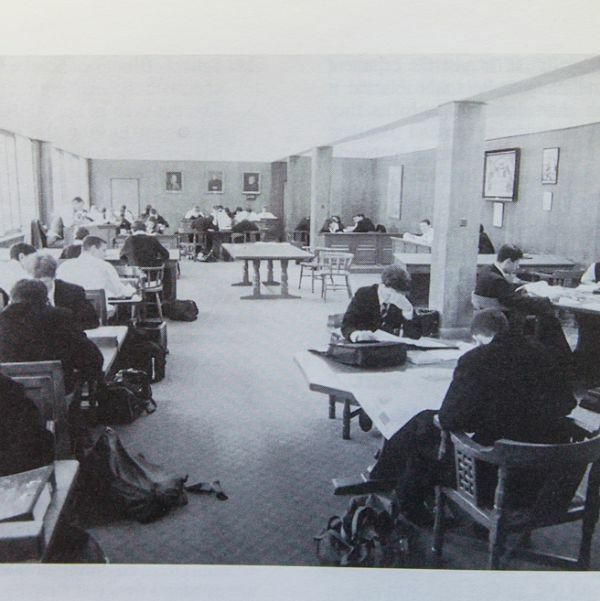 It was called The Gerard Library as a memorial to Dom Gerard Hayes who was Headmaster of the Upper and Middle School for only a couple of months, dying suddenly of a heart attack in December 1960 (The Priorian (94), p.204). 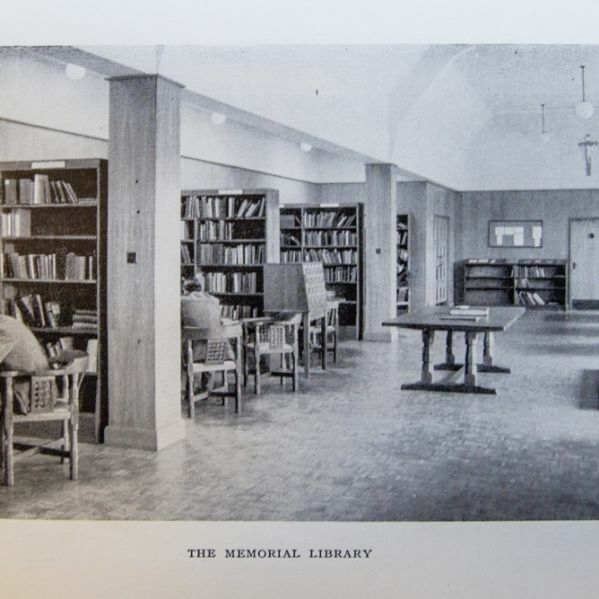 A new room was added to the Memorial Library in 1967: “a very small stack room allows space for browsing…and has provided extra shelving which is rapidly being stocked with new books obtained from the generous increase in the library allowance. (The Priorian (89), p.103)”. This room came to be known as the ‘Reading Room’, held the book stacks, and was where the librarian worked. 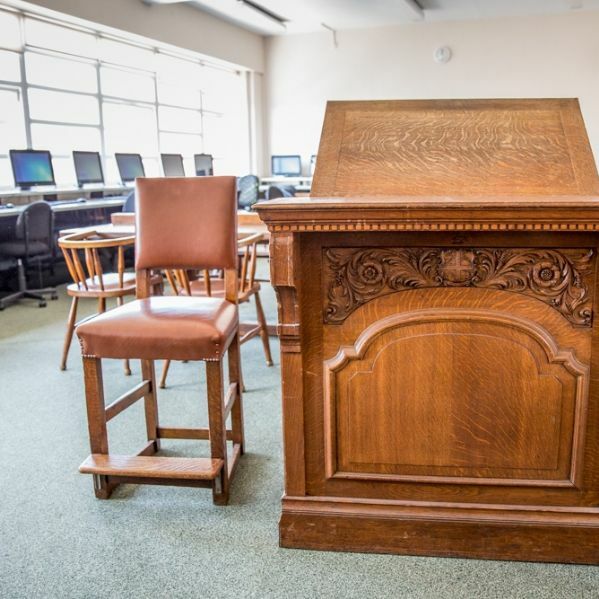 It is now called the e-Learning room, accessed through the main library, contains a suite of PCs and is where various lessons occur throughout the day. Mrs A Hopper was Senior Librarian up until the summer of 1972, when Mrs Y. Skilling took up post in the autumn of 1972, working as librarian for 15 years until 1987. It was at this point Mrs Sally Mortimer took over, working for 25 years; retiring only at the end of the summer term 2012, she is the longest serving librarian at St Benedict’s to date! 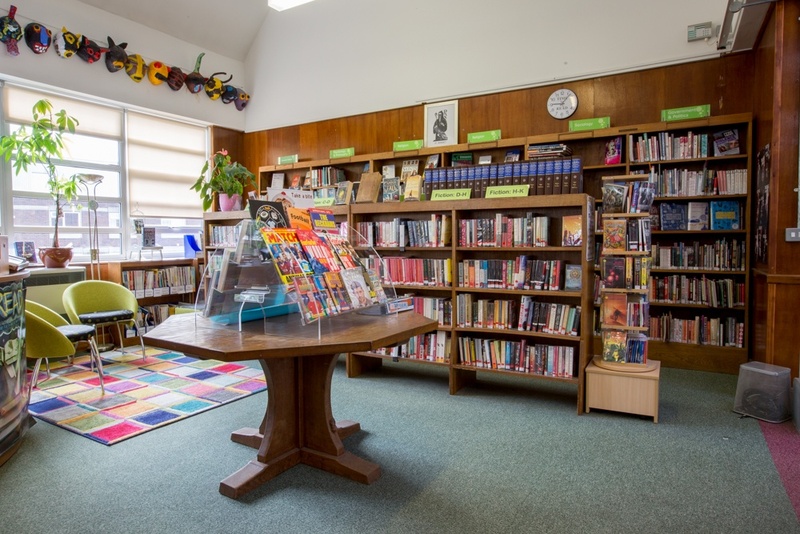 In 2012, under librarian Mrs Diane Maxton and Assistant Librarian Mrs Argentina Barreto, the main library was extended to include a Middle School Book Room, designated as a reading space for the younger years. The conjoining wall between the main library and the science lecture theatre was removed, integrating this room into the main library. 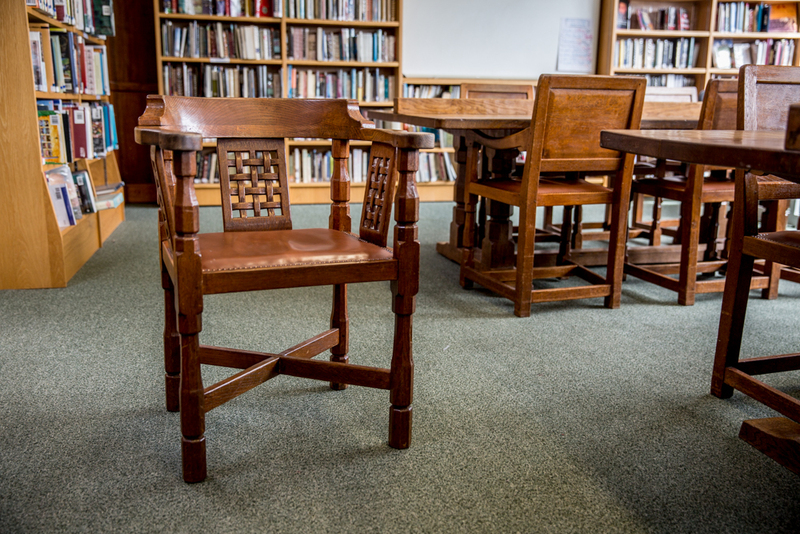 The Middle School Book Room “has a modern look with white bookcases, two sofas and several cushioned stools. 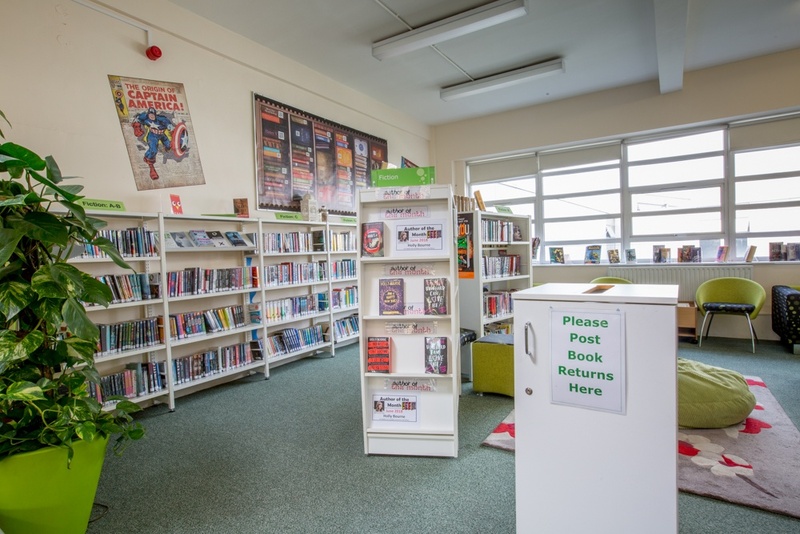 Colour has been introduced through carpet, soft furnishings, acrylic panels and signage and the same green colour scheme has been continued into the main library and Reading Room.” (The Priorian, 2012-2013, p.14) Miss Kristabelle Williams Pearce then took over as librarian between 2014-2016, followed by myself in September 2016! 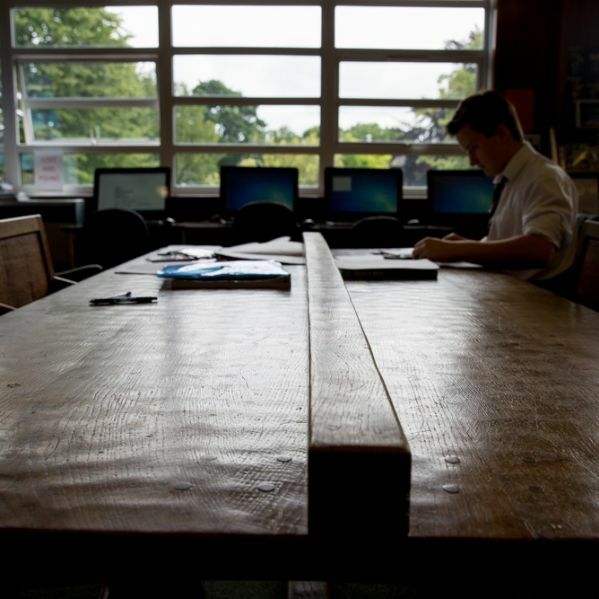 Today the Senior School Library holds a collection of nearly fifteen thousand books, numerous PCs and is open to all years to use throughout the school day. 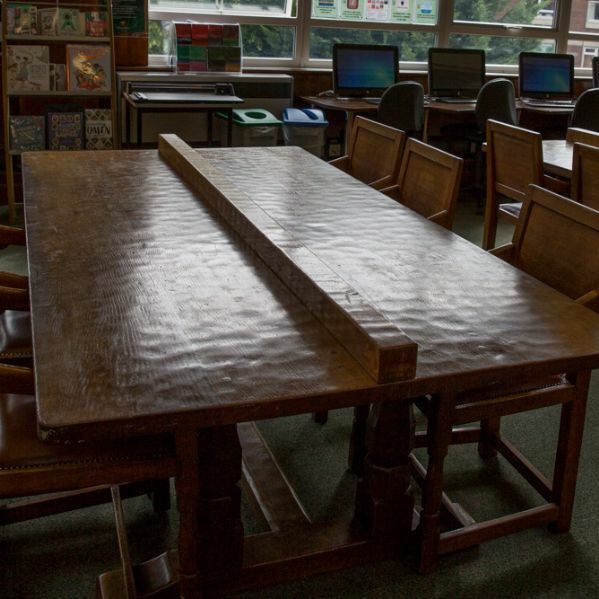 The impressive Robert ‘Mousey’ Thompson furniture, described in 1957 as giving “a remarkable dignity and grace worthy of a Memorial Library” (The Priorian (64), p.55) is still used by pupils today. 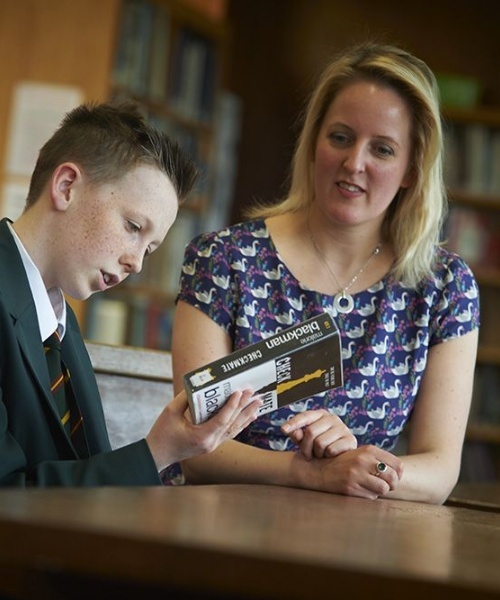 We hope to continue celebrating the history of the libraries and ensure that they are central to pupils’ enjoyment, learning and studies at St Benedict’s now and into the future!